Meanwhile the four Visegrád countries (the Czech Republic, Hungary, Poland and Slovakia) who have not been not invited to join these discussions, are also at the forefront of this ideological campaign to seal the Balkan route. Their motivation is based on an Islamophobic narrative, as advocated by Hungarian prime minister Viktor Orbán, a self-declared enemy of liberal democracy and consolidator of aChristian front against the Islamisation of Europe. 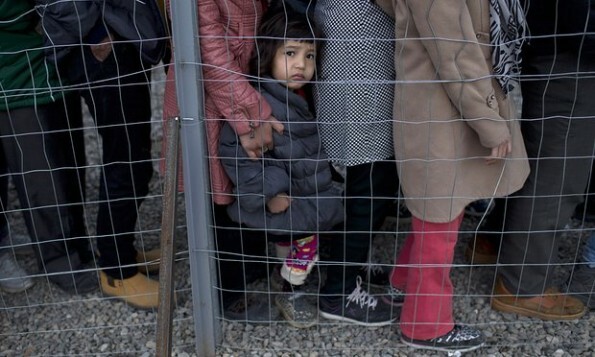 Despite having accepted 90,000 people last year, Austria is the latest country to impose quotas on asylum seekers and send refugees towards Germany. Trying to avoid disaster in the forthcoming election against nationalist Heinz-Christian Strache and his Freedom party, its terrified leadership has moved from social-democratic moderation to rightwing extremism within a few months. Chancellor Faymann has been dwarfed by an emerging nationalist star, the 29-year-old minister of foreign affairs, Sebastian Kurz, who lobbied hard for the ringfencing of Greece after failing to force the Greek government into pushing back boats in the Aegean sea. The declaration produced after the meeting yesterday branded the refugee crisis an illegal migration issue, cynically ignoring the suffering of hundreds of thousand of people escaping war. Consider for a minute the “invasion” these leaders are moving against. Figures show 34% of refugees are children, thousands of them unaccompanied. Another 20% are women. The vast majority of these people are families fleeing conflict. Just under half are Syrians escaping Islamic extremism themselves. The refugee influx amounts to less than 0.5% of the European population. This was never an unmanageable problem for the EU: it is an issue only for nation states. But resorting to nationalist fixes is a cheap solution. Those finding comfort in virulent leaders are set for a huge surprise. The formal declaration of Europe failing to respond collectively to this crisis is about to cause a huge backlash to EU institutions. And the degradation of a system of institutions, no matter how ineffective and despised they may have become, will reverberate into homes. Nationalist hostility between states will mean decades of stable diplomatic relations deteriorate. The slowdown of economic activity throughout the continent will impact on pay packets too. When other problems strike, EU partners won’t be a stabilising factor to resort to. Mistrust and dishonesty are going to spread like a disease. We have reached the point of no return without a plan. Greece cannot go on like this: mostly due to the fact that a sequence of political developments has brought its ineffective government to the largely unwanted place of defending the 1951 Refugee Convention in its desperation for a European solution for the arriving refugees. The UNhigh commissioner for refugees, visiting Athens this week, committed the UNHCR to increasing its involvement in reception operations in cooperation with the Greek government. He has to deliver on this as soon as possible. The European commission should do the only thing it does well: pick up the bill. It has a lot to lose if it doesn’t. Furthermore, a UN humanitarian evacuation plan (from Turkey and Greece) reaching beyond the EU should be put in place immediately. If EU technocrats and state leaders won’t do it in Brussels there is another way. Last week Portugal offered to resettle refugees from Greece. Yesterday, Spanish regional officials reached an agreement for the transfer of a thousand migrants – bypassing the European Union’s slow moving relocation system. Smaller scale, decentralised solutions are easier to finance, legally feasible, and they set a precedent. Democratic communities can do what states have failed to achieve by reacting to the real crisis Europe is facing today: the racist and nationalist backlash throughout the continent. There are a lot of people out there who remember well that the failure of Europe has been blamed on the weak in the past and where this leads. We will fight against it.